Hello Everyone and Welcome back to my blog! I've been having so much fun playing with colorful eyeshadows and making myself get out of my comfort zone! I love the colors Pink, Purple and mint, but I didn't have a mint so I used a baby blue. This look reminded me of cotton candy so that's where the name of the tutorial comes from. I couldn't think of anything else to title this tutorial so that's what we have. I can only be creative for so long and for so many things, titling things isn't one of them as it seems, lol. 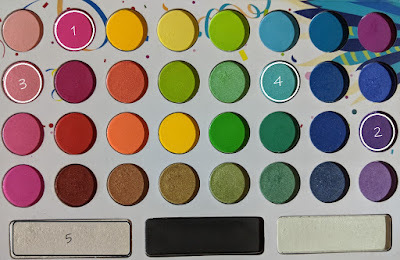 Today I used the BH Cosmetics Take Me Back To Brazil palette that I've had almost a year I think. I've seen pictures of the Morphe x James Charles palette and i'm just craving colorful makeup! I hope i'm able to purchase the palette. But blogging doesn't really make any money for me so I'm extremely lucky to buy anything I can! Starting out this makeup look, I took my concealer and my beauty sponge and patted it on my lids in a thin layer. I used just enough to hide my veins and discoloration, but I didn't add so much that it was heavy and creasy. I did not set the concealer, I wanted to keep the base tacky to insure the eyeshadows were vibrant and didn't ware away. Picking up color 1, a bright fuchsia / darker hot pink I packed it on the outer corner of the lid making sure to start creating a sharp line. 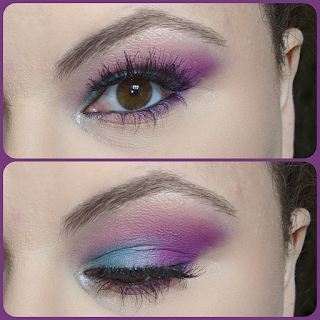 I slowly added more color, lightly blending into the crease and bringing it up pretty high. I then picked up color 2, a darker purple, and patted it on the outer edge blending it into the pink for a soft transition. I also took in onto the outer 2/3 of my bottom lash line. Picking up shade 3, a bubble gum pink, I took it on a blending brush and started buffing out any edges and bringing it close to the head of my brow. 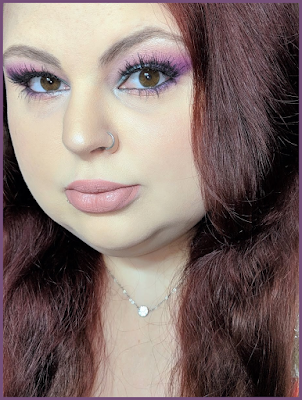 I also put it on my blower lash line, fading it from the purple to the inner corner. For the final actual lid shade I picked up shade 4, a light blue with the slightest green tint on a wet brush and patted it onto the lid from inner corner about half way. While I was packing the blue on, I made sure to softly tap out any edges so it didn't look harsh and sloppy! Shade 5 is basically a sheer highlight shade that has a pinkish gold shift, I used this on a wet brush and put it in the inner corner and under the arch of my brow bone! This is also what I used to highlight the rest of my face with, on top of another highlight shade! Here you guys have a close up shot of the eyes with my eyes open and shut so you can see the look in all of its glory! I honestly am in love with this look and i'm super proud of how well it came out! I hope you guys love this look as much as I do. If you recreate it let me know on Instagram! My handle is @LulusLifeBeauty! I have a full list of products, tools and social media links down below. If you would like to support me, please make sure you follow me on Instagram, and share this post on social media!